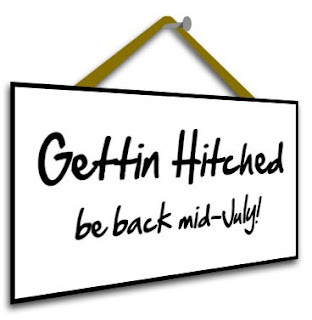 Dave's Getting Married – Back in a month! That’s right, folks, now begins a whirlwind month that includes my bachelor party (New Orleans, woo! ), wedding, honeymoon, and moving apartments! And in the midst of all that activity, I thought it best to take a hiatus from Unpressable Buttons and come back when I have both the time and energy to resume pondering product design. So, come back in mid-July for a resumption of my daily posts – or subscribe to the blog, and you won’t even have to worry about remembering. Good Experience Blog - Mark Hurst’s blog focuses on the user experience, touting it as the raison d’etre for all products. Also be sure to check out the Flickr photo group he administers, ThisIsBroken, chock full of designs gone wrong. Uselog (aka The Product Usability Weblog) – Jasper van Kuijk's blog on consumer product usability, with consistently excellent examples and intelligent commentary on product design. Small Surfaces – A blog by Gabriel White, a former coworker, focusing especially on human-computer interation in handheld devices. And of course, the sources for most of my material, Gizmodo and Engadget - dozens of posts a day on gadgets ranging from brilliant to boneheaded. Check’em out, and just think – why will or won’t this work for users? It’s the game I play every day!